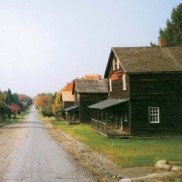 Founded in 1854, Eckley is an example of a planned nineteenth century coal mining town. It is a community, or coal “patch town,” which provided mining families with the basic necessities such as housing and medical care, as well as basic amenities like a store, a school and churches. It is a dramatic introduction to the life of the anthracite miner and his family.